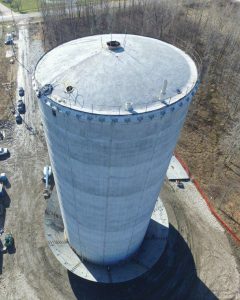 On June 19, it took four hours to raise the new $8 million 40-foot bowl of Avon Lake’s Regional Water Tower to the top of its 140 foot base. The three million gallon tank will serve as a storage reserve which would be used during high demand periods as well as during the winter in case frazil ice blocks the intake valves on Lake Erie. The tower is expected to be filled by the end of the year and will serve 200,000 users. MWHC has been serving as the construction manager at-risk (CMAR) on the Avon Lake Storage Improvements Project water treatment plant, which is the first water treatment plant to be built using the alternative delivery method in Ohio. Due to the increase in population and bulk-water sales to other cities, the Avon Lake Municipal Utilities Water Filtration Plant needed to replace its 500,000 gallon tank with a three million gallon tank.